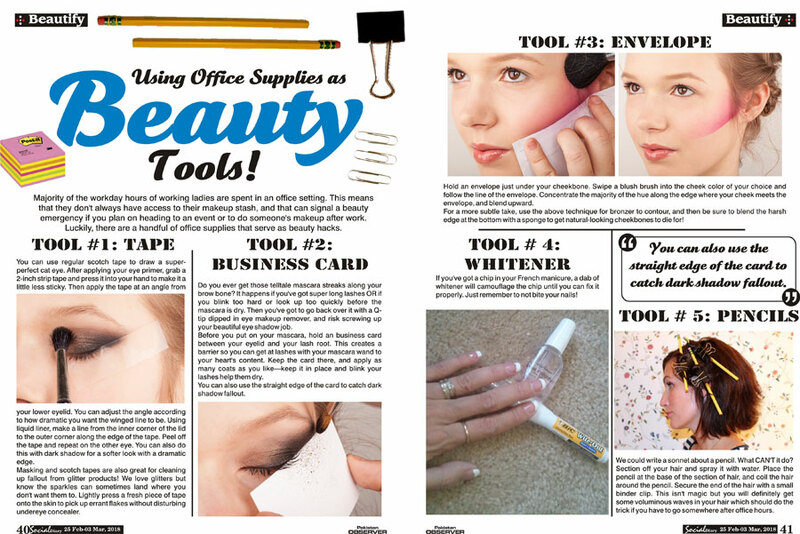 Home Beauty Focus Using Office Supplies as Beauty Tools! Majority of the workday hours of working ladies are spent in an office setting. This means that they don’t always have access to their makeup stash, and that can signal a beauty emergency if you plan on heading to an event or to do someone’s makeup after work. Luckily, there are a handful of office supplies that serve as beauty hacks. You can use regular scotch tape to draw a super-perfect cat eye. After applying your eye primer, grab a 2-inch strip tape and press it into your hand to make it a little less sticky. Then apply the tape at an angle from your lower eyelid. You can adjust the angle according to how dramatic you want the winged line to be. Using liquid liner, make a line from the inner corner of the lid to the outer corner along the edge of the tape. Peel off the tape and repeat on the other eye. You can also do this with dark shadow for a softer look with a dramatic edge. Masking and scotch tapes are also great for cleaning up fallout from glitter products! We love glitters but know the sparkles can sometimes land where you don’t want them to. Lightly press a fresh piece of tape onto the skin to pick up errant flakes without disturbing undereye concealer. Do you ever get those telltale mascara streaks along your brow bone? It happens if you’ve got super long lashes OR if you blink too hard or look up too quickly before the mascara is dry. Then you’ve got to go back over it with a Q-tip dipped in eye makeup remover, and risk screwing up your beautiful eye shadow job. Before you put on your mascara, hold an business card between your eyelid and your lash root. This creates a barrier so you can get at lashes with your mascara wand to your heart’s content. Keep the card there, and apply as many coats as you like—keep it in place and blink your lashes help them dry. You can also use the straight edge of the card to catch dark shadow fallout. Hold an envelope just under your cheekbone. Swipe a blush brush into the cheek color of your choice and follow the line of the envelope. Concentrate the majority of the hue along the edge where your cheek meets the envelope, and blend upward. For a more subtle take, use the above technique for bronzer to contour, and then be sure to blend the harsh edge at the bottom with a sponge to get natural-looking cheekbones to die for! If you’ve got a chip in your French manicure, a dab of whitener will camouflage the chip until you can fix it properly. Just remember to not bite your nails! We could write a sonnet about a pencil. What CAN’T it do? Section off your hair and spray it with water. Place the pencil at the base of the section of hair, and coil the hair around the pencil. 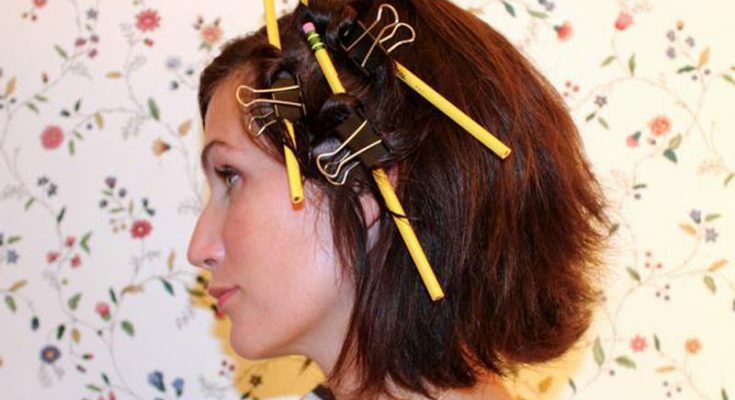 Secure the end of the hair with a small binder clip. This isn’t magic but you will definitely get some voluminous waves in your hair which should do the trick if you have to go somewhere after office hours.